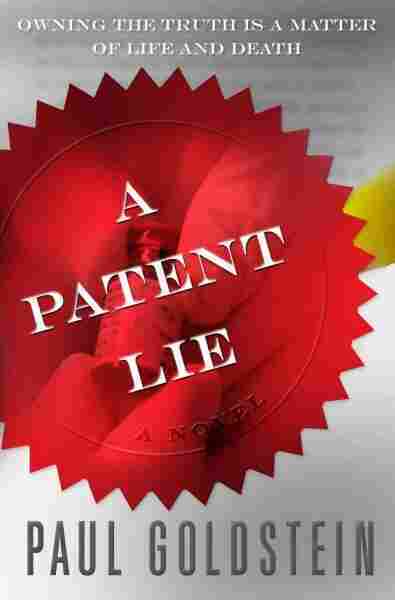 A Patent Lie NPR coverage of A Patent Lie: A Novel by Paul Goldstein. News, author interviews, critics' picks and more. July 16, 2008  A Patent Lie, the new novel by Paul Goldstein, trumps John Grisham's work in every way — character, setting, plot and prose — and gives readers interested in the drama of a high-value legal case a great reward for their attention. The last time Michael Seeley saw his brother it was in a hotel kitchen in San Francisco and Leonard was arguing with the hotel's catering manager over the bill for his wedding reception. Workers were cleaning up and the pulsing bass from the dance band in the next room echoed over the clatter of silverware. Seeley had to catch red-eye back to New York City, but the caterer was implacable and Leonard wouldn't let up, even when Seeley signaled that he was going to leave. Only after Seeley started out the door did Leonard stop, flinging his arms open to pull him into an awkward embrace. "Let's stop being strangers, Mike." Leonard's breath tickled his ear. Seeley broke away without answering. He loved his younger brother in the sense that he cared about his well-being, but he neither liked nor trusted him. In the nine years since the wedding Leonard had called three or four times and sent his annual Christmas card. There was a printed announcement when he moved his medical practice from Palo Alto to San Francisco, and another last year when he took a job as chief medical officer at a biotech company in South San Francisco. The announcement, mailed to Seeley in Manhattan, caught up with him in Buffalo, where he had moved his law practice. His first job out of law school had been in Buffalo. However, this time he was practicing not in the city's largest firm but by himself, and not in a steel-and-glass office tower but in a small office in the Ellicott Square Building, an ancient pile of bricks in the center of the city's half-deserted downtown. Seeley's feet were up on a corner of his desk. Behind him, the single window looked out onto Swan Street, four stories below. His large shoulders hunched forward as if he was trying to warm himself against the chill scene outside. Rudy, the building's boiler man, was maneuvering a giant wrench beneath the decrepit steam radiator by the door and offering his views on whether the radiator was the oldest in western New York or in the Western world when a movement of yellow and gold flashed by the open door. Seconds later, Seeley's part-time receptionist leaned into the office. "Someone to see you." There was an unfamiliar thrill in Mrs. Rosziak's voice, as if the visitor were a celebrity, or at least a client more prosperous than the ones who usually came to the office. "From California." She underlined the words. "Your brother." It was Leonard's sandy hair and the lemon V-neck under a brass-buttoned blazer that created the impression of yellow and gold. The wariness in Leonard's eyes when he came into the room didn't match the broad smile and outstretched arms. His arms dropped when he saw Seeley's frown. Leonard transferred a thick manila envelope to his left hand and reached the other across the desk. Seeley's single thought as he took his brother's hand was how quickly he could get him out of the office. He had already planned his day: reviewing client files, preparing for two court appearances in the early afternoon, visiting a jailed client who had been unable to make bail. Rudy packed his toolbox and, going through the door, saluted Seeley with a promise that the radiator would be fine for at least another century. Seeley gestured for Leonard to take the client's chair across from him. "It's nice to see you, Len, but I'm busy, and if you flew out here to pitch your case, you wasted your time." "I left a message with your girl that I was coming." The thought of Mrs. Rosziak being called a girl amused Seeley, but not enough to make him smile. "She told me." Leonard had been leaving messages with Mrs. Rosziak for a week. His company, Vaxtek, had filed a lawsuit against St. Gall, the giant Swiss drug producer, for infringing the patent on Vaxtek's entry in the race for an AIDS vaccine. With the trial three weeks away, Vaxtek's lead lawyer suddenly died. Seeley understood that the company's future depended on winning the lawsuit, but he also knew that any one of hundreds of lawyers could try the case. Leonard was looking for something more. "Why didn't you call back?" "I didn't want to encourage you." "Always looking out for your little brother." Leonard smiled around the words. "Still the college quarterback. A little thinner, maybe, but still a full head of hair." He patted the top of his own head where, Seeley guessed, the hair had been carefully barbered to hide a bald spot. The color, though Leonard's as a boy, now surely came from a bottle. Leonard's eyes moved around the office, taking in the metal bookshelf stuffed with a worn, black-bound set of McKinney's New York Code, the half-dozen vintage prints of the Buffalo harbor that leaned against the bottom shelf waiting to be hung, two ancient file cabinets, and the window with its gray outlook. Leonard was perspiring. Was he wearing a great deal of gold, or did it just seem that way? It struck Seeley that the charm on which Leonard survived as a boy had lost some of its polish. "This is your kind of case, Mike. Little guy takes on big guy. David against Goliath. You get to be David's lawyer." "Your little guy is a publicly held corporation. I don't represent corporations anymore. I sue them." Leonard said, "In a single day, St. Gall makes more off its cure for erectile dysfunction than we make on all of our products in a year. They're a thousand times our size. In broad daylight they steal our biggest patent, and do you know what they say? I'm at a conference in Miami, giving a presentation, and when I finish, St. Gall's vice president for research--an MD, the guy with the same job as me--comes up and says, 'We're going to crush you.' That's it. He doesn't say hello, or I slept through your speech, or your patent's no good. Just, 'We're going to crush you.' Then he walks away." Across the room, the radiator banged as if it had been struck by a hammer. The hiss of steam that followed had a rusty, boiled smell. "You could take them down, Mike. I followed every one of your cases when you were in New York." He patted the hidden bald spot again. "You didn't know I did that, did you? I took subscriptions to a couple of legal newspapers just so I could keep track." That wasn't the kind of thing Leonard would do. "I clipped out the stories and gave them to Mom." "That's the past, Len. I don't do that kind of case anymore." His brother's persistence was making Seeley repeat himself, and he resented it. "I went out on a limb for you. I had to sell you to our general counsel, and then the two of us sold you to our chairman. He's counting on you." "Then he's going to be disappointed." "I thought that if I could make you understand how important this is to me, you'd take it." Leonard removed a handkerchief from an inside pocket of his jacket and wiped his forehead. When he unbuttoned the jacket, Seeley saw that he had put on weight since the wedding nine years ago. Seeley felt a moment's sadness for Leonard and for his brother's dream of repairing a family that was broken from the start. Seeley said, "I never saw you as a corporate type. I pictured you in a white coat, healing the sick." "Or telling them they're going to die. I spent four years doing that. Half my patients in San Francisco were HIV positive. The other half already had AIDS. It's why I took the job at Vaxtek. What we have is as close as anyone's come to a real AIDS vaccine. Do you know how many lives this is going to save when we get our FDA approval? Here. Africa. Around the world. How many lawyers get the chance to defend a patent like this?" "How did he die?" If he changed the subject, Seeley thought, Leonard might give up and leave. "The lawyer who was trying the case." "Bob Pearsall was a fine lawyer. He was in your league, Mike. He orchestrated the case like Beethoven. A family man, too. Everyone loved him." What Seeley heard was, a beloved family man, unlike MichaelSeeley. Leonard waited, and when Seeley didn't speak, said, "He threw himself in front of a train." "How else does a fifty-eight-year-old man end up dead on the railroad tracks?" "Who knows? His health was perfect--I know his doctor. He was an outdoors nut. Camping. Bird-watching." "What I said. Suicide. One of life's mysteries. Who knows what's beneath the surface?" When Leonard read in the legal newspapers about Michael Seeley's courtroom triumphs, could he have imagined the dark corners that his older brother was navigating on his own precipitous slide? Trying big cases back to back, winning trials that he had no right to win, all the time retreating deeper into shadows that were visible only to him. It was no mystery to Seeley that despair could so engulf someone riding the crest of his career that he would decide to end his life. "What time of day did it happen?" "Early in the morning. Before dawn. Why would it matter?" Seeley said, "I was wondering if anyone saw him do it." He could almost hear the wheels turn as Leonard calculated whether the lawyer's death might be the hook that would bring his brother to San Francisco. "Where did it happen?" "A half hour south of San Francisco. He lived in the city. There weren't any witnesses." "Why would he go that far from home? Was it close to a station?" "Somewhere between stations, I think. Would it make any difference for you taking the case?" "I was just wondering why someone would go so far out of his way to take his own life." "Like I said, who knows what he was thinking? Look at the photographs in the obituaries. Half the time, a guy kills himself and in the picture he's got a big smile on his face." "In Pearsall's photograph—was he smiling?" "Like he was having the time of his life." Leonard leaned forward and with his index finger pushed the thick manila envelope on the desk toward Seeley. "What can I say to get you to come to San Francisco?" Two questions fought in Seeley's mind, one asking why he would let himself slip into his brother's plans for him, the other, why he wouldn't. When Leonard first called, Seeley turned him down at once, making the decision even before his brother could describe the lawsuit. After that, from the messages Mrs. Rosziak passed on to him, Seeley knew that, although the case was big, it could be tried in less than a month. For that short a time he could easily arrange continuances for his few cases in Buffalo. Wasn't this why he left his large corporate firm in New York City--not just to pick his clients and have no partners to answer to, but to be free to take cases of moral consequence. How many of his current cases came close to the heft of this one? Vaxtek was hardly the helpless victim that Leonard painted, but the multinational St. Gall was a war machine, and if Leonard was telling the truth his company's survival depended on this patent. Seeley said, "I'm not admitted to practice in California." If Leonard was in fact following his career, he knew that his brother regularly tried cases outside New York State. A simple motion to the court, granted virtually as a matter of course, was all that it would take for him to appear. "You've done it before—practiced in other states." Seeley said, "Why are you smiling?" "I didn't say I'd take the case." Leonard lifted his hands, placating. "I was just going to say I'm glad you'll consider it. That's all I'm asking for. Willingness." He pressed his palms against his lap and rose. "Let me take you to lunch. Give me a chance to find your weak spot." Leonard's confidence annoyed Seeley. "I have to be in court at two." "My flight's at three-thirty. Is the Hatch still open?" "The places on the lake close down after Labor Day." "Let's go and look. It's worth a try." The Hatch was little more than a lunch counter on a built-up part of the Lake Erie shore, locally famous for its grilled bologna sandwiches--a massive slab of meat tucked into a hard roll along with a pile of grilled onions and a slathering of bright yellow mustard. Seeley remembered childhood outings when Leonard would inhale the sandwich as greedily as if it were a communion wafer. Seeley again thought about motives-Leonard's in pursuing him, his in resisting-as he lifted the camel-hair coat from the stand by the anteroom door and handed it to his brother. He took a maroon scarf from the other hook and threw it around his neck. At her desk, the surface filled with a collection of creams and lotions, Mrs. Rosziak beamed. The office's exterior walls were the original lath and plaster, but the partition that divided Seeley's office from the receptionist's anteroom was thin wallboard, and from the officious bustle of papers Seeley knew that she had eavesdropped on the conversation. As soon as the door closed behind him, she would be on the phone to the airlines, checking on flights to San Francisco. The sky had been a muddy gray since the beginning of October, and Buffalo wouldn't see the sun again for months. Over the past week, an errant snowflake or two would materialize out of the crisp air and as quickly disappear. Any day could bring the first snowfall. But more than the snow and bitter cold, it was the prospect of this unrelenting, joyless sky that defined the season for Seeley. The cold slowed Leonard's chatter as they walked, and he seemed almost contemplative. The three or four blocks that radiated south and west from the Ellicott Square Building resembled a bustling downtown, but once the brothers passed the city's police headquarters, a squarish afterthought of dirty yellow brick, the office buildings gave way to a grim patchwork of low anonymous structures, weed-choked lots behind chain-link fences, and here and there a darkened church. The bundled-up pedestrians disappeared, and closer to the thruway overpass the downtown traffic dwindled to the occasional car cruising Erie Street, hip-hop blasting from behind rolled-up windows. In the shadow of the overpass, the temperature suddenly dropped ten degrees. Thruway traffic drummed the vaulting concrete. Leonard huddled into his topcoat. "One thing I'll take to the grave with me is the bleakness of this place. I can be at the beach in the middle of July, but if I think about Buffalo, I feel the cold in my bones." Seeley said, "Austerity has its virtues."